FRAIL Zimbabwean dictator Robert Mugabe could be succeeded by his wife as it was revealed the military will have no say in who takes over. The country’s army commander today revealed the military will have no power over who is the next president but this has not stopped some top military generals attempting to influence the outcome. Mr Mugabe, who at 92 is the world’s oldest political leader, has held power since the country gained independence from Britain in 1980. But he is increasingly looking frail, stoking a scramble from within his Zimbabwe African National Union-Patriotic Front (ZANU-PF) party. Some senior military generals and a group within the party are backing Vice President Emmerson Mnangagwa to succeed Mr Mugabe. 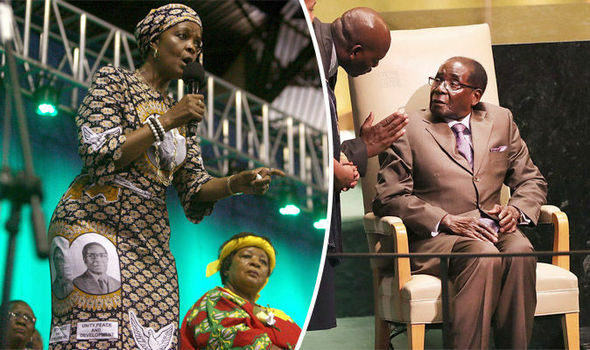 Another faction is widely believed to be manoeuvring to impose Mr Mugabe’s wife Grace as a possible successor. 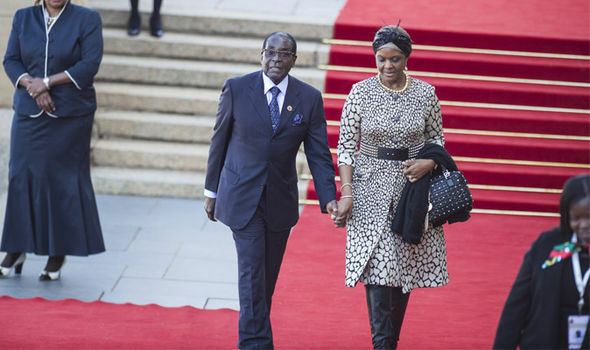 The 51-year-old is almost as controversial as her husband, with sanctions placed upon her by the European Union and the United States for her role in the Mugabe regime. She is known for her lavish tastes, including reportedly spending £75,000 during a short trip to Paris in 2003, which prompted the sanctions in a bid “to stop Grace Mugabe going on her shopping trips in the face of catastrophic poverty blighting the people of Zimbabwe”, an MEP said. Lieutenant-General Valerio Sibanda, the Zimbabwe National Army Commander, told the state-owned Sunday Mail newspaper the military should not get involved. Last year in December, Mugabe warned against the country’s military generals and other security services supporting different candidates, saying it could ruin ZANU-PF. Opposition parties accuse military commanders, who fought in the 1970s independence war, of working hard to ensure ZANU-PF remains in power. On the eve of presidential elections in 2002 and 2008, military generals said they would not salute a leader who had not fought in the battle for independence. This was seen as an attack on main opposition leader Morgan Tsvangirai, who did not participate in the liberation struggle. 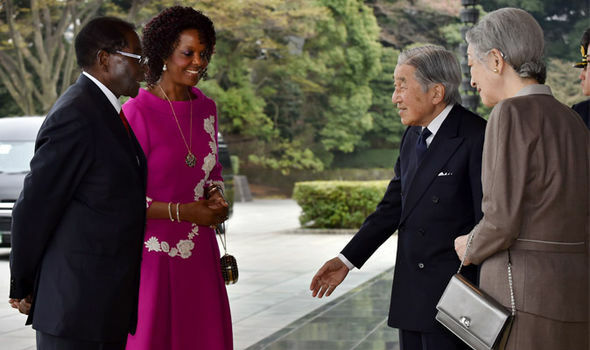 Mr Mugabe, who is widely blamed for plunging his country into economic despair, continues to surprise Zimbabweans by sporadically appearing at events following rumours he has died. However, just a month later his health appeared to be more of an issue, with Lord Peter Mandelson, one of Tony Blair’s sidekicks, warning the British Government Mugabe is preparing an “endgame” for the country, suggesting he believes he is close to death. A note to civil servants after a visit to Zimbabwe in August, said: “Any discussions of business – or indeed most aspects of life – was inevitably a discussion of politics and the intense speculation and manoeuvring over the succession to President Mugabe is dominating. “It is clear that the endgame is underway, and the battle is being vociferously played out in the Zimbabwean press. Mr Mugabe’s critics say he has presided over the destruction of a once-promising country with policies such as the seizures of white-owned farms. But the President’s ruling party blames foreign powers for sabotaging the economy with sanctions. Mugabe’s government has experienced increasingly bad cash shortages over the past seven years since abandoning its own currency in a bid to end hyperinflation. The Zimbabwean dollar was abandoned after Mugabe ordered 1,000billion Zimbabwean dollar notes to be printed, quickly becoming worthless and black market US dollars taking over before becoming the southern African country’s official currency in 2009. Much of Zimbabwe’s industrial companies have had to close down due to demands white-owned businesses hand over 51 per cent to black Zimbabweans, high taxes and labour laws which make it almost impossible to sack anybody, all under Mr Mugabe’s rules. The highly controversial eviction of white farmers has meant nearly every supermarket product is imported, unlike 15 years ago when most produce was locally sourced. 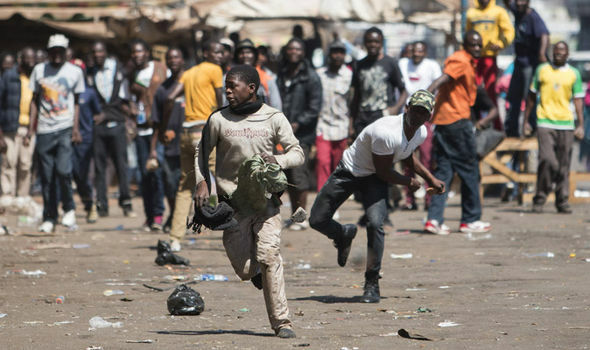 Protests have marred the dictator’s leadership this year, with workers across the country taking part in a “shut down” strike in July – the biggest protests since April 20017 when opposition leader Mr Tsvangirai led anti-Mugabe demonstrations.